Soulful lyrics, haunting vocals, melodies that will hook you at first listen. Blues, folk, rock, pop, country- take a dive into a pleasurable enigma. 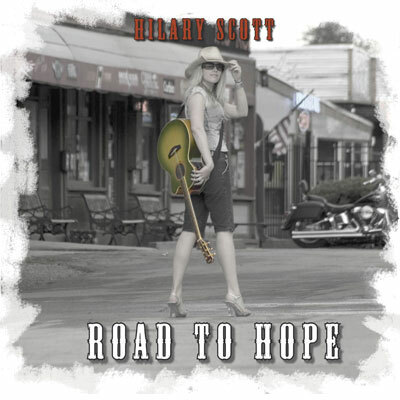 Hilary’s most recent release, ‘Road to Hope’ is a fantastic portrait of the height of the Hilary Scott Band’s work together. With Bill Adams on acoustic guitar and slide, Michael Bielski on djembe and percussion, Carol Elliot on cello, Matt Griffin on harmonica, Rob Lampe on electric guitar and lap steel, Mike Robertson on bass, Loyd Warden on drums and Hilary on piano, guitar, violin, mandolin, and vocals, this album takes you on a journey. The first song, ‘Daydreamer,’ sets the mood, as ‘everything starts with a dream.’ The rest of the album continues its moody course through trials and triumphs, highs and lows, ending with hope, and one eye always to the future. There are an unprecedented 4 cover songs on this album, including Leonard Cohen’s ‘Hallelujah,’ Patty Griffin’s ‘Long Ride Home,’ Bob Dylan’s ‘To Make You Feel My Love,’ and mid-Missouri legend Lee Ruth’s ‘You Electrify Me.’ Fans have been clamoring for recorded versions of the band’s renditions of these popular songs for years, and here they are – with full emotional force! The idea for the album’s title and theme came from the area where Hilary grew up, in the northwest, and the tiny town of Hope, Idaho, which was near her grandparent’s cabin on Lake Pend O’Reille and which has fascinated Hilary since she would spend her summers there as a child. Besides the link to the town’s name, ‘Road to Hope’s’ themes are accessible on many levels, not only the obvious and tangible. This is an incredibly emotional and important work for Hilary. Also of interest is the fact that Hilary invited natives of the area around Hope, Idaho, to enter a photo contest, and the winning photo by Rick Miller is included in the CD artwork – this artwork is already gaining attention for the incredible photography by Kevin Dingman and the poignant visual themes.